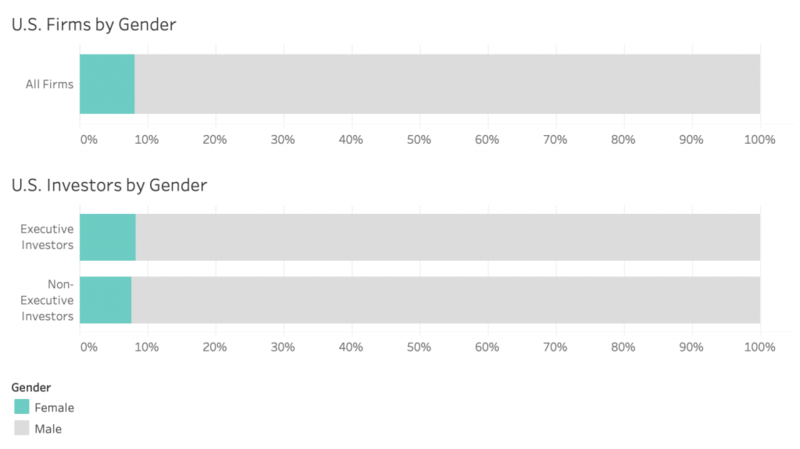 Chicago Blend survey confirms VCs are, unsurprisingly, overwhelmingly white and male. It’s no secret that tech and venture capital, like most industries, are suffering from a lack of diversity within their ranks. Insiders and outsiders alike have been exposing the negative consequences of that homogeneity, from Susan Fowler’s memo on Uber’s toxic culture, to Ellen Pao’s lawsuit against Kleiner Perkins, to ProPublica’s investigation into discriminatory ads on Facebook. But with companies slow to acknowledge the scope of the issue, critics have turned to employment data to better illustrate just how heavily skewed these workforces are. This summer, The Center for Investigative Reporting published data from 211 major tech companies (though most of it was anonymous), and a number of studies and surveys of the tech industry have emerged in recent years. With VC firms, the data has been harder to come by. The Information has its VC diversity index and investor Richard Kerby has compiled his own dataset, both covering firms nationally. Until recently, little work had been done at the regional level outside of Silicon Valley. But thanks to Chicago Blend, a new initiative aimed at “tracking, supporting and increasing diversity, equity and inclusion in Chicago VC and startups,” that is beginning to change. During September and October, Chicago Blend collected data on 348 employees from 70 active, Chicago-based funds with at least $5 million in assets. The results paint the clearest picture yet of ethnic and gender diversity — or the lack thereof — in Chicago’s VC industry. Taking a snapshot of employee diversity is of course just one metric — it’s also important to explore factors like retention rates, promotion opportunities and percentage of investment dollars going to founders from underrepresented groups. Still, Chicago Blend’s survey provides an essential starting point and helps contextualize Chicago’s VC demographics with those of the country’s largest firms. Below are some key trends that emerge when comparing their results to The Information’s VC diversity index, which includes 624 individuals from 73 firms with at least $200 million in assets. Of the Chicago VCs surveyed, 86.5% are white, 8.6% are Asian/Indian, 2.6% are Black, and 0.9% are Latino/a. The executive investor cohort (those involved with both management and investment decisions) is even less diverse, where 90.3% are white, 6.1% are Asian/Indian, 3% are Black, and none are Latino/a. Slightly better represented among non-executive investors (those involved with investments but not with operational decisions) are Asians/Indians, at 15.4%, though that same group is still 78.6% white and only 1.7% Black and 1.7% Latino/a. 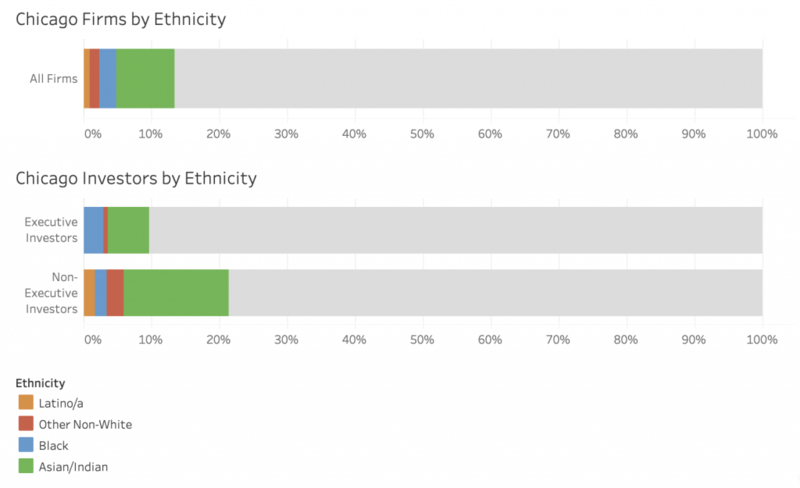 Despite the fact that Chicago is more ethnically diverse than the United States on average, comparing Chicago Blend’s data to The Information’s VC diversity index shows that Chicago VC firms are, in aggregate, less ethnically diverse. The picture is a bit more nuanced looking at each ethnicity individually. For example, only 0.7% of U.S. VCs are Black (compared with 2.6% for Chicago). But at the same time, 1.3% are Latino/a (with only 0.9% for Chicago). Most diversity among U.S. VCs comes from those identifying as ethnically as Asians/Indians, who make up 20.5% of the industry (just 8.6% for Chicago). 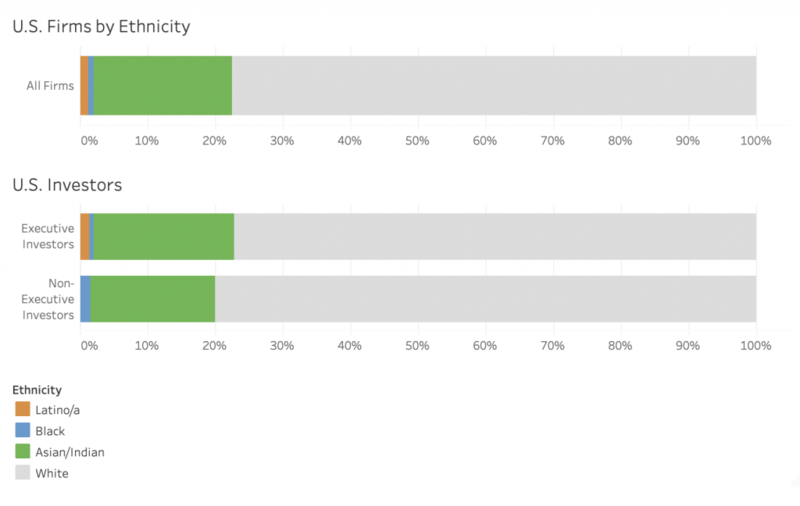 Overall, that means 77.5% of U.S. VCs are white compared with 86.5% of those based in Chicago. Neither are anywhere close to being demographically representative, but it’s noteworthy that VCs in Chicago are even less reflective of their own community than the industry is as a whole. The gender gap is only slightly less pronounced. Of Chicago VCs, 72.7% are men while just 27.3% are women. Again, that disparity is even more stark at the top, where 87.3% of executive investors are men, compared with only 12.7% for women. Among non-executive investors, 73.5% are men and 26.5% are women. 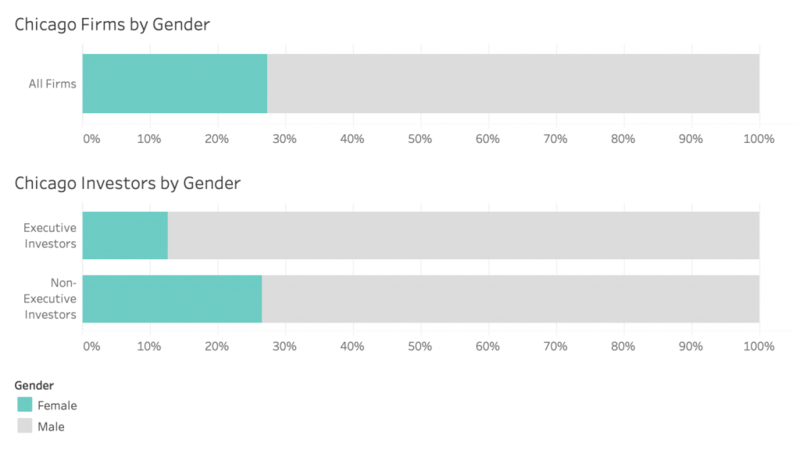 Chicago’s gender imbalance is, however, less egregious than the industry as a whole, where a full 91.8% of VCs are men while a mere 8.2% are women. Obviously, that’s more an indictment of venture capital than it is any reason for Chicago VCs to celebrate. With its ranks skewed so heavily male already, it’s perhaps not surprising that industry doesn’t tilt much further at the top. Here, executive investors are also split 91.8% men to 8.2% women, while non-executive investors are split 92.3% men to 7.7% women. While these statistics offer only a two-dimensional snapshot of ethnic and gender diversity in Chicago’s VC community, they are a necessary starting point for any conversations or initiatives that aim to address the underlying factors. What’s needed next is additional data for Chicago firms around metrics like retention, promotions and who receives venture money (and how much), because offering someone a job doesn’t necessarily mean a firm becomes more inclusive or equitable. This is especially true in venture capital, where a firm’s hiring practices have a ripple effect on the types of entrepreneurs they choose to invest in. For its part, Chicago Blend is already looking to tackle that side of the equation as well, and plans to collect founder data for venture-backed startups in the coming months. Some analysis has already been done on gender and racial gaps in venture funding nationally, but in order to address Chicago-specific issues, it’s crucial to look at Chicago-specific data as well. Thanks to Lindsay Knight of Chicago Blend for sharing additional context about their survey, Zach Wise and our interactive journalism class for feedback on this story’s visualizations, and Joe Germuska for helping me wrangle my data.